“I got the papers, but he pretty nearly runs the show,” Captain Henry Balfour told Detroit River reporter George Abrams, pointing to his Russian Poodle dog stretched out on the deck. 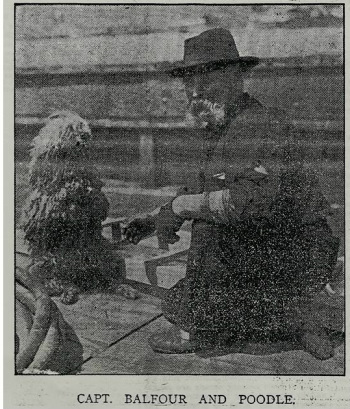 Captain Henry Balfour of Marine City, Michigan, his genuine Russian Poodle dog and his vessel, the Barge Keweenaw, all had exciting histories before they joined forces to become one of the most famous sights on the Great Lakes as well as the Detroit and St. Clair Rivers. In 1866, T. Arnold of Newport (Marine City) Michigan built The Keweenaw, number 14043, as a side-wheeler. She underwent major repairs in 1881 and in 1886-1887 she was converted to a two- masted wooden schooner barge in Detroit. On June 17, 1889 while being towed by the steamer J.E. Potts, the Keweenaw collided with the barge John Martin which in turn was in tow of the Steamer City of Cleveland. The Keweenaw sank, in Neebish Rapids in the St. Mary’s River near "Rain’s Dock" but was raised and refloated. Born in Dundee, Scotland on February 22, 1840, Henry Balfour came to the United States and settled in this Marine City, Michigan. He began sailing the Great Lakes in 1859 on the Mary Collins of Ashtabula. During Civil War he served in the Navy on the gun boat Siren, in the Mississippi Squadron. After the Civil War he returned home and to his sailing on the Great Lakes. He served as master on the Forester, Mary Stockton, the Leader, the Hattie, George W. Bissell, and the Buck Eye State before he came to the Keweenaw. In 1862, he married Miss Maria Caswell, a native of Marine City and they had five children-Frances, Catharine, Mary, William, and Robert. It didn’t take the Captain and Poodle long to become inseparable and the Captain vowed he’d never part with Poodle for the largest sum of money around. He said that Poodle was a splendid watchdog when the Keweenaw was in port and he would let Poodle guard any sum of money. “No one dares to enter my room while I am asleep,” Captain Balfour said. He continued to extol Poodle’s virtues. He said that although Poodle was generally suspicious of strangers that came aboard, he was unfailingly courteous and gentle with women and girls. No man could steal him, but any woman no matter how she treated him, could lead him off. Captain Balfour tested him by bringing aboard a little boy and a little girl dressed almost exactly alike. Poodle was affectionate toward the girl, but not at all friendly with the boy. Captain Balfour sheared part of Poodle’s heavy wool off during the hot summer months, but by winter it had grown in again as thick and luxuriant as before. The Captain recalled that a few seasons ago while the Keweenaw was in Ashtabula a Russian Finn who had spotted Poodle, came to him and offered to pay him if he would shear off Poodle’s wool and give it to him. He said that his daughter was very sick and that the wool had medicinal properties that he believed would help her. He said that in Russia sick people who wore garments made of poodle’s wool were healed. Finally heeding the Russian Finn’s pleas, Captain Balfour sheered Poodle and gave him the wool, refusing to take any money. Several months later when Captain Balfour again anchored in Ashtabula, the Russian Finn came to the Keweenaw with his daughter. He had made the girl a pair of stockings out of Poodle’s wool and he stated that she was improving very rapidly. Captain Balfour had to agree. The girl looked rosy cheeked and healthy. One day in April 1901, two visitors ascended the port ladder of the Keweenaw which lay in midstream of the St. Clair River waiting for the ice blockade to break. They noticed a beautiful, although not too clean rug, curled up near a hatchway. One of the visitors who fancied himself a connoisseur of rugs started to examine it more closely, but as he smoothed the fur the rug suddenly growled and curled its teeth in a hostile manner. Captain Balfour spoke a quiet word which sounded like “bath” to the rug, which was his Russian Poodle, and Poodle immediately jumped up and down and rolled across the deck. Captain Balfour explained that Poodle was very averse to a real cold water bath and that when the Captain said bath, he assumed that he needed one. Poodle’s thick hair almost totally obscured his eyes and teeth and when he was on dog watch it gathered dust and dirt like a magnet. Before he could go on shore leave, he had to have a bath, so whenever the Captain said “bath” Poodle thought it was time for shore leave. Warm weather liberated Poodle, Captain Balfour and the Keweenaw from the St. Clair River ice and they continued their Great Lakes voyaging until November 8, 1901. On that day a northerly storm blowing through the mouth of the harbor at Grand Marais in Lake Superior wrecked the Keweenaw. She was later recovered although the underwriters had declared her a total loss and sailed the Great Lakes for five more years. Then in 1906 she sprang a leak and sank in Sandusky harbor and was abandoned. Captain Balfour and Poodle continued to be familiar nautical sights in Marine City for years after the Keweenaw sank.